The chock-a-block design of Sheridan College’s Davis campus on McLaughlin Road would get jarring double-takes from architectural purists. In his book Concrete Reveries, University of Toronto philosophy professor Mark Kingwell writes that mismatched structures offer few visual delights, especially if they sit in stark contrast to their surroundings. Yes, there’s a strange incongruity at work here: a certain poetic nuance that clangs against a nihilistic emptiness. A kooky charm lingered on a visit to the campus last week. It was as if a kid put a scale model together with half-broken pieces from a Lego set. The campus feels like it is playing catch up with itself – a school built during a hyper-growth era that keeps adding students and makeshift spaces until the pile-on overwhelms the main buildings. After a few wrong turns (entering Building A and C instead of B — the generic naming suits the lack of pretence on campus, it’s all down to business) the destination is finally rounded on: Room B204, and the office of Michelle Chrétien. • At both Xerox and Sheridan, she has been focused on leading and enabling applied research in advanced manufacturing, including 3D printing, automation, robotics, computer aided design, printed and flexible electronics, and more. The native of Nova Scotia has an inquisitive nature and lofty expectations and thrives on solving tough problems like how to put data and science to work. She’s in the midst of building new capability and infrastructure to support innovation in advanced manufacturing. This is where matter and mind intersect, where students, faculty, business, and government can build a thalamic bridge. Chrétien’s passions are rooted in commercialization of innovation and public engagement in science, and she has substantial experience with Canadian funding programs for academia, entrepreneurs, and small/medium-size enterprises. 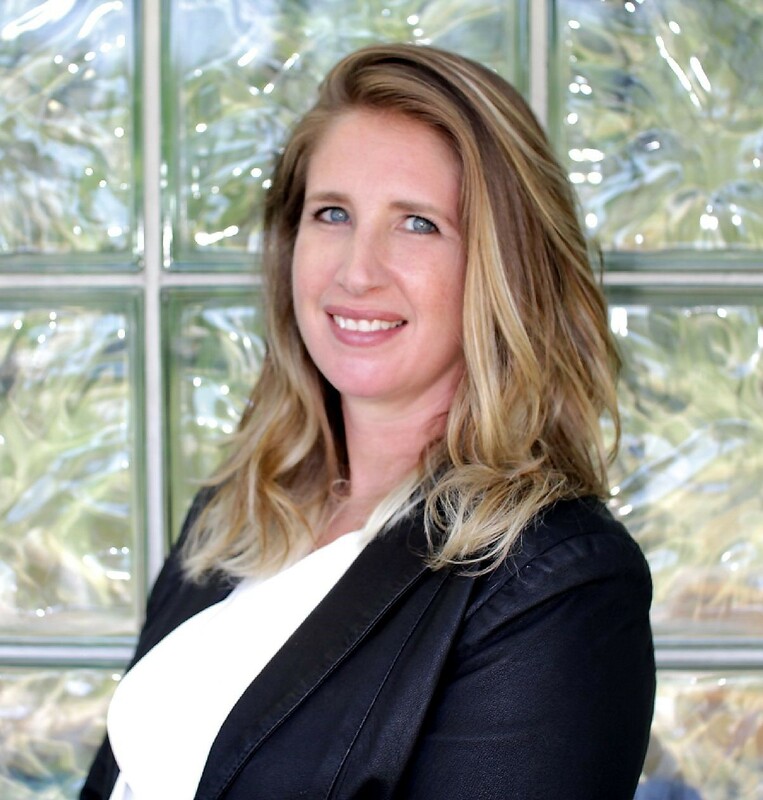 She enjoys working with companies to help them achieve their business and technology goals. She is that rare individual who can straddle the often oppositional worlds of enterprise and academia. After receiving her BSc in chemistry from Dalhousie University and PhD from the University of Ottawa for work in photochemistry and photophysics, her PhD thesis was nominated for the Governor General’s Medal and was awarded the International Union of Pure and Applied Chemistry (IUPAC) Prize for Young Chemists. She has published 21 scientific papers in peer-reviewed journals and holds 81 US patents on novel materials and manufacturing technologies. 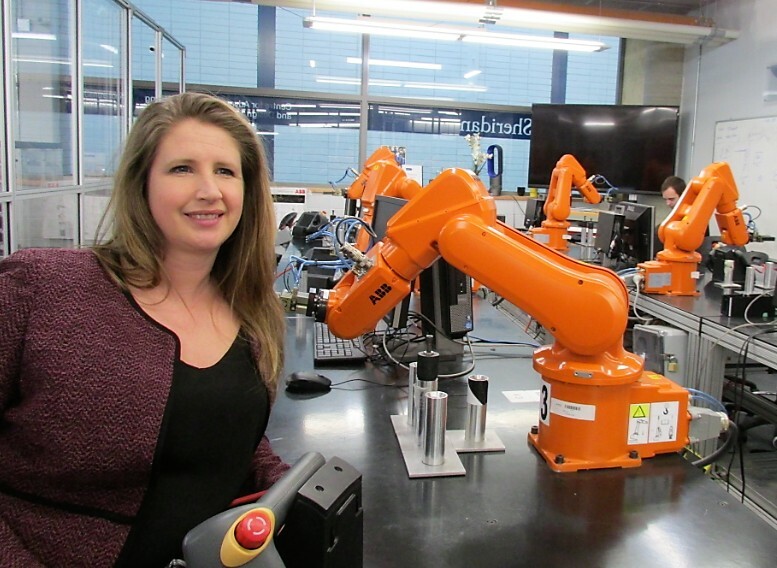 No doubt, plucking her from business and swooping in before another post secondary institution was a coup for Sheridan, and she seems the perfect fit for the advanced manufacturing school at the Davis campus. There’s a notable hunger to succeed here and create a new business model. This heavy water is being carried by all the stakeholders, with Chrétien as the overseer. Ground zero for much of this partnership is the advanced manufacturing program that connects its business partners (many located in Brampton) with students and faculty to work out solutions to manufacturing problems. The teaching classroom is downstairs from Chrétien’s office and is colloquially referred to as the ABB Robotics Lab, which houses the overall space we toured later in the Advanced Manufacturing Lab – or, The Garage. Brampton’s ABB – part of the global robotics and automation technology giant headquartered in Zurich with operations in 46 countries – and its robots are front and centre here and can be programmed to magically transform theory into practice. This is where student and faculty share ah-hah moments. For example, a smart furnace filter was created here, leading to a Brampton-based start-up called Clean Air.ai. ALVI is their product and brings cleaner, better air to homes, changing the way people interact with their furnace by incorporating artificial intelligence that turns these metal heating boxes into intuitive, human-like robots. The Savaria project is another example of an academic-business-government alignment that created a solution directly impacting the bottom line. The challenge was to create an automated lift chair frame alignment system, for Savaria Concord Lift Inc. 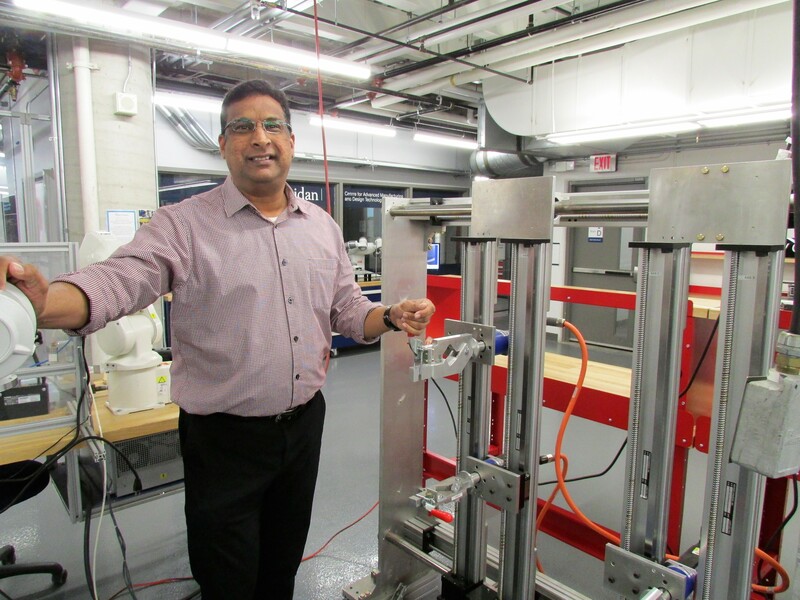 The Sheridan Advanced Manufacturing team of Dr. Srinivas Ganapathyraju (faculty) and Carlos Paez (student), used funding from FedDev Ontario, to solve a connector problem for this leading manufacturer of vertical and inclined platform lifts for home and commercial use. The company needed to automate the alignment of tubular frames during the welding process in order to reduce setup times and optimize the manufacturing process for their lift frame structure. The Sheridan team, in partnerships with the company, developed a novel system that involves the design and fabrication of a prototype for an automated lift chair frame alignment system along with a robotic welding system. As a result, an automated test rig using servo motors was built. A user-friendly Human Machine Interface panel as well as a programmable robot for welding brackets and gear systems were developed. Savaria will improve their competitiveness and product quality while reducing the lead time for manufacturing lift chair frames. Sheridan’s advanced manufacturing is providing an entry point to a new way of doing business. The time and money saved by building innovative systems is creating this new economic modeling. Sheridan’s partnerships with robotics providers like ABB, and working in concert with the EDO (economic development office) at Brampton City Hall has created both unique start-ups, and partnerships with businesses looking to upgrade their offerings. The visit to the Davis campus was timely, since just a day earlier, MP Navdeep Bains (Mississauga-Malton), the Minister of Innovation, Science and Economic Development, spoke at a Brampton Board of Trade event dubbed, ‘Building a Nation of Innovators,’ at the Garden Banquet Convention Centre. 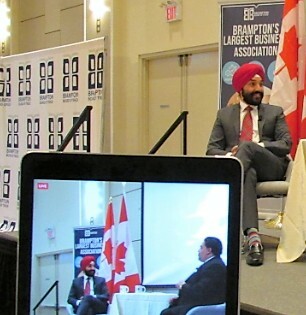 Bains, whose parents moved to Brampton in 1987, was on hand to also discuss the recent federal budget and how it would impact on the local business community. Two of the most ardent listeners in the crowd were Chrétien, and Brampton Mayor Patrick Brown, who was also in the middle of budget discussions at city hall. The talk seemed to take on added importance because a schism seems to be developing between federal and provincial lawmakers. The Doug Ford regime at Queen’s Park (which purports to being “Open For Business”) has come under sharp criticism at the municipal level for “stalling tactics” in handing over federal money already earmarked for infrastructure renewal. A key area of federal investment, as Bains knows well, is in innovation, technology advancement, research and development, and money from Ottawa, when it flows, often ends up in institutions just like Sheridan. The taxpayer funding does exactly what the public expects it to, providing crucial seed money and other investments to grow the economy while putting Canadians on the cutting edge of future labour and employment trends. Ford, however, has unsurprisingly politicized this flow of money for the benefit of industry and enterprise, claiming much of the federal funding is just cheap, ineffective electioneering. He has already boasted that his government will use its political influence to support the federal Conservative Party candidates in the October election, and will frame Ottawa’s top-ups to cities and institutions as blatant vote-grabbing tools. It will be important for city hall and local innovators, including Sheridan to keep pushing for federal money, free from the political strings, to create the ABBs and Clean Air ai’s of the future, right here in Brampton. The Ford regime put a major wrench in one plan that has the potential to take the city to another level of academic-corporate partnerships to help job-creating enterprise while growing the local economy. The Premier pulled back $90 million in funding for a proposed Ryerson University campus in the downtown core of Brampton, which would have been a major connective element of the city’s 2040 Vision plan to shape an entirely different future for the country’s ninth largest municipality. Stymieing a potential business-academic-government partnership that would help turn campuses into incubators to expand innovative opportunities, is a clear contradiction of Ford’s claim of being “Open For Business”. He has closed a castle-sized door to major potential, for now. Brampton, located in the middle of the Kitchener-Toronto Technology Corridor has aspirations of being a technology hub which follows the Brown plan of creating thousands of high-paying jobs in the city over the next decade. But these are the same aims of most cities today, as old low-return employers and land-eating industrial operations are being dumped in favour of sleek, high-paying technology and innovation partnerships. It’s clear from Bains’ comments, Ottawa has decided to leapfrog the province and build a direct relationship with cities like Brampton. The new federal budget includes $80 million for new Cyber Security Centres across the country, and Brampton, through a planned partnership with Ryerson, could get some of that money. The city’s four Liberal MPs, according to emails to The Pointer this week, are fighting to get Brampton a share of the $80 million pie, while an extra $16 million in federal monies from its gas tax will be funneled to be used for the city’s infrastructure needs. What MPs need to realize is that such promises in an election year while their party is on the ropes, ring hollow to many in the city who expect their elected representatives to work 24/7 to win crucial investment for the voters who sent them to office, from the second they get there. Bains used the event to tout his government’s record since getting elected to a majority in 2015, including a 3 percent overall economic growth rate (1 percent when it took office, and once again slowing down), the creation of 750,000 jobs, and the lowest unemployment rate in 40 years. But creating jobs isn’t enough, as news leaked out later in the week, that 1,500 jobs (an entire shift) at the Fiat Chrysler plant in Windsor have been eliminated, putting the future prospects of the enormous FCA plant on Williams Parkway in peril – and its nearly 4,000 workers. Bains talked about creating new jobs, jobs for the future, and the transformation of skill sets to make workers more hireable in an innovation economy. “Part of our budget will be skills employment,” he said, and the greatest need is creating great local talent – the kind being produced at the Davis campus of Sheridan College. Some of the government initiatives involved work integrated learning, and even offering businesses or citizens $1,000 if they take a four-week, back-to-school program that scores them a new certification in certain high-demand fields. The problem, said Bains, is that Canada has to continue technological advancements because there is a gaping divide with 216,000 openings left unfilled in some high-skilled categories. The feds have even identified a need to offer up a long-term training plan that tumbles all the way down to public schools. The CanCode program started investing $50 million over two years, beginning in 2017-18, to support initiatives providing educational opportunities for computer software coding and digital skills development to Canadian youth from kindergarten to grade 12. The program aims to equip youth, including traditionally underrepresented groups, with the skills and study incentives they need to be prepared for the jobs of today and the future. He said 36 percent of public schools offer no form of coding, which he said is wasting a talent base that is already drawn to digital applications and design like moths to light, and are eager to learn more. This stands in sharp contrast to what is happening at the other end of the demographic spectrum. The closure of the GM plant in Oshawa, announced last year, is a warning that legacy manufacturing needs support in order to remain a robust part of the Ontario employment scene. Bains said in Ontario, 500,000 workers are directly or indirectly impacted. One of the biggest problems for the auto industry in Canada is its failure to keep up with advanced manufacturing technologies, just like some of those being developed at Sheridan, being used by the industry in other parts of the world where the cars of the future are designed and produced. 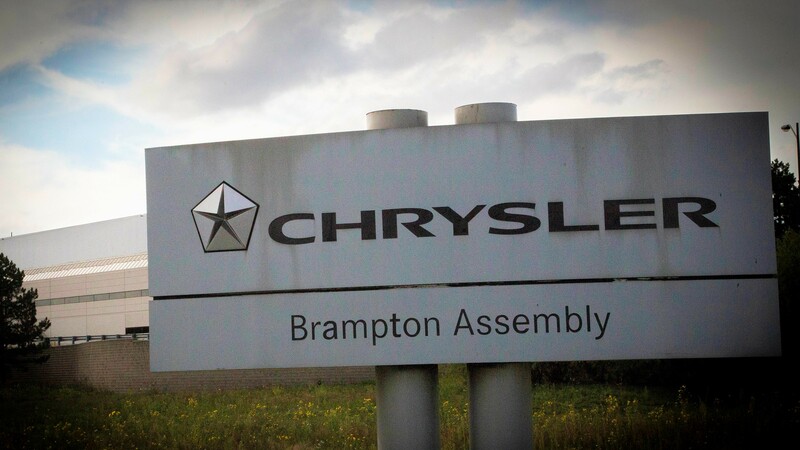 News of the shift shutdown and 1,500 layoffs at the FCA plant in Windsor, is a chilling reminder of Oshawa, and would have an enormous ripple effect here if the Brampton plant is one day targeted for closure. The low-tech skill levels at auto plants has created a conundrum for Ottawa (and Queen’s Park): Promises and billions of dollars in taxpayer funded incentives to the auto-giants located here to keep plants open, look like naive twaddle in light of what has happened in Oshawa and Windsor. Bains admits that Canadian companies have to up their game when it comes to innovation, research and development. And this is where we shift back to Chrétien’s office at Sheridan. As she discusses the future of job creation, and the urgent need for innovation, she pulls a book from her shelf and plops it down on her desk then slides it over. It’s a thick, soft-cover text, with this rather bland title: Competing in a global innovation economy: The current state of R&D in Canada. It should be a must-read for anyone interested in finding out where Canada stands in the global pecking order for R&D (near the bottom) and why (Chrétien, who was one of the editors, offers up a few reasons). The book's conclusions create a disquieting feeling about Canada's economic future. We are not investing in R&D at the levels our governments and private sector did in the past; specialized areas of research with significant application and economic potential are being ignored; core fields in applied science and engineering, the root of much innovation, are underfunded; R&D funding is being spent in waning areas that are not at the centre of technological innovation; unlike more risk-taking countries, there is a lack of innovation and R&D investment here by entities that don't seem to understand wealth creation is directly tied to such investment. We are missing out on opportunities while old ways of doing things continue among those who could be putting their money to better use. The book is available at www.sciencecadvice.ca, and these numbers are the most troubling: Canada is 33rd out of 40 countries measured on its index of spending on R&D intensity and growth and R&D. China and India, once the home to low-cost manufacturing, are quickly moving up the Organization for Economic Co-operation and Development (OECD) value chain. China is No. 1, followed by the U.S., South Korea, Israel and Japan. Cast your eyes down and pass Greece and Portugal before you find Canada, right there with Slovenia and Estonia. Chrétien joined an expert panel in conducting extensive interviews and checking out the findings' validity. Being at Xerox, and now Sheridan, she sees firsthand why investing in R&D isn’t just a virtue or aspiration, but a necessity. She summons up the old truism, “Innovate or Die,” to describe the choices faced by Canadian businesses and governments. The embrace of science and technology and building a better business model that includes partnerships between business, academia and government, should be non-partisan, she said. That’ why she is so excited that Sheridan is on the cutting edge of all this change. In 2017, the Brampton campus officially opened its new Skilled Trades Centre, a three-storey, 130,000-square-foot, state-of-the-art facility (yes, it’s an architect’s delight) which pushes skilled trades and apprenticeship programs and was previously offered at the school’s Oakville campus. This September, the school’s new Mechanical Engineering degree will see students working with industry-standard advanced technology in its very first semester. 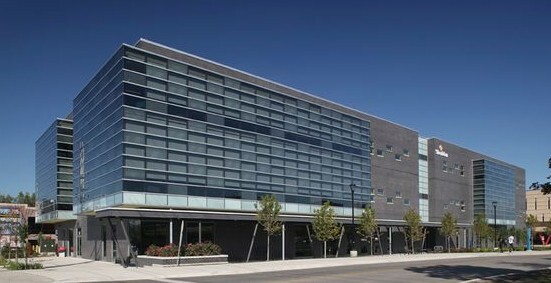 The Davis location, named after former premier and hometown legend Bill Davis, is the largest campus in Sheridan’s three-city portfolio (Brampton-Oakville-Mississauga) and home to more than 12,000 students. It’s a bustling, innovative and multicultural campus and features applied health, community services, engineering and top technology programs. It fits perfectly into Brampton, one of the fastest-growing, educated and most ethno-culturally diverse communities in Canada. The new engineering degree course aims to create job-ready graduates, who will work with the latest mechanical engineering technology. There will be specialization in energy or mechatronics (applied engineering that combines robotics, mechanization, computer systems and telecommunications in a product design ecosystem, creating the world of the future) with co-op and other student placement programs to ensure they get hands-on learning experience to prepare them for a dynamic, rapidly evolving work-world. Sheridan has strong relationships with A-list industry partners like Siemens, Hatch, Cimetrix and ABB Robotics. These partnerships are particularly strong in the areas of applied research and students’ capstone projects, which allow them to put their learning into a specific piece of work that represents what they will be doing while on the job. It’s all about project-based learning to create a competitive edge. The applied research projects take several forms: non-funded, curriculum-based ‘capstone’ projects (teams of upper-year students in a project-based course are matched with industry/community partners and develop solutions to their particular challenges); funded (co-op) projects; funded (non-co-op) projects; and internships. The age-old perception that community colleges aren’t up to snuff in comparison to the big-time universities across Canada, is being turned on its ear as many of those university grads are coming to Sheridan to upgrade their skills to make them job-ready in the ever-changing marketplace. 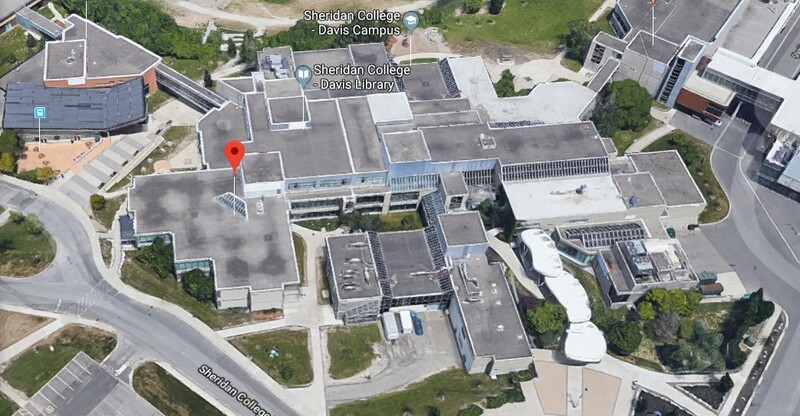 Sheridan's Advanced Manufacturing program was looking forward to partnering with Ryerson when its downtown campus was scheduled to be built in Brampton. Other outside incubators like the RIC Centre, plus local businesses were all supposed to be part of an integrated network that would create start-ups, enhancing existing firms looking to upgrade their businesses, or form unique partnerships to get innovative products and designs to market. While the Ford government decision eliminated that opportunity, for now, Chrétien says Sheridan will continue its partnership with the City of Brampton, businesses like ABB, and others, and create a giant business incubator that will sustain itself against the challenges of an economic system that rewards the innovative and punishes legacy businesses that don’t have the capacity or flexibility or inclination to change their model. While Sheridan promises a state-of-the-art education at the Davis campus, its mishmash of buildings is anything but. Chrétien admits that the pre-fabricated look of the campus can be slightly off-putting at times, but it also sits as an example of a school that can hardly keep up with itself. Sure, one day she hopes to see a new-look campus arise off McLaughlin Road. It might even be an architectural delight. But right now, it’s a hive of creativity and the students and faculty are a-buzz with what is being accomplished there – especially in the advanced manufacturing and design areas. The school is an example of what can be accomplished when a school, city, businesses, and governments form a partnership team that creates a new made-in-Canada business model.